You are here: HomenextTopicsnextTransportnextJoy riding in the skies over Wickford, 1928. Walter (W.G.) Pudney was a New Zealander, born in Wellington, who came to the UK at the start of WW1, in 1914. Initially fighting in Gallipoli where he was wounded, he later joined the Royal Flying Corps (later the RAF) where he was in combat over the trenches. He was demobbed in 1919. He comes to note in Wickford for giving pleasure flights over the town as early possibly as 1923. We have a picture here of an Avro 3 seater ex-WW1 aircraft, (dated 1928?). It is possible that he used the WW1 airfield off Brock Hill, although other sites may have been used. 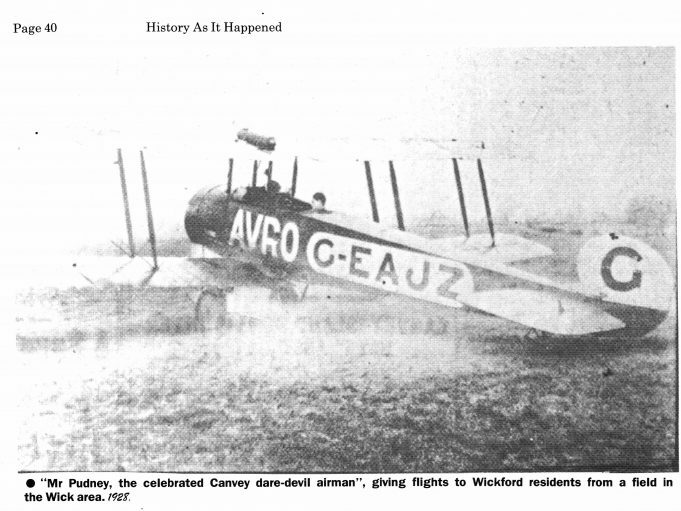 Mr Pudney gave joyrides to the residents of Wickford in his plane in the late 1920s from the Wick. Can anyone remember parents or relatives talking about this? Possibly the field he flew from was the 14/18 war airfield that apparently ran parallel with Church End Lane, east to west, part that is mentioned elsewhere by David De’ath, which was used temporarily during the beginning of 39/45 war.